Our Custom Photo Cutting Board Is Practical, Fun to Use and Makes a Great Gift for The Chef in Your Life! Add interest to your kitchen décor with our personalized glass cutting board. We have two sizes and a wide range of photo templates to choose from so you can prepare food in style. Our cutting boards aren’t just practical; they also allow you showcase your favorite photos and add a fun flair to your cooking routine! Once you have selected your photos, you are all set to begin creating a personalized cutting board of your own. We offer many custom options so that you can design yours to compliment your kitchen décor or that of a loved one for a unique, thoughtful gift. First, select a style for your cutting board. Pick from a variety of templates including full photo, photo collage, accented background patterns and more. After your project loads in the builder, you can choose your photo layout, background and then add your photos and text for a customized look. When you have finished, just load your project into the cart and place your order. Once your cutting board arrives, you can display it on your kitchen counter to add a little color and character to your décor or store it away in your cabinet for easy access. Our custom glass cutting board makes food preparation fun while allowing you to relive your favorite memories. Both practical and stylish, our photo glass cutting board is a great way to show off your best pictures. You can display a single photo with our full photo layout, create your own collage or choose from several background templates to accent your pictures. Our cutting boards are great for any photo, whether it’s a natural landscape, family snapshot or even a wedding memory. Maybe you took an unforgettable photo of a waterfall at a recent visit to a national park. Why not use it for your cutting board design. Choose one of our rustic background accents to go with your photo and add your own text to transform your cutting board into a commemorative piece. Perhaps you have a series of silly family snapshots stored on your phone. Upload them to MyPix2 and use them to design your own collage. Each time you prepare vegetables and cook dinner for the family you can be sure your cutting board will bring a smile to your face. Our photo cutting board can be displayed on your kitchen counter. Design yours using one of our stylish background templates to match your kitchen décor. Photos are a great way to liven up any space in your home and the kitchen is no exception. In addition to our personalized photo cutting board, we have several practical kitchen products that you can embellish with your favorite memories. Maybe your kitchen table is in need of an update. Make your own customized dinner mats to liven up meals with your family. We have several templates to pick from you can design a unique table setting for each person at your table. We also have personalized hand towels and photo serving trays that are sure to come in handy each day. Or, make your own personalized photo apron with a favorite photo and quote for a look that’s uniquely “you”. Add a little life your day by turning your kitchen into a gallery of your favorite photos. Our custom kitchen accessories make a great addition to any home, no matter your style. Whether the holidays are just around the corner, you’re shopping for a unique wedding gift or you’re looking for a fun housewarming present, our custom photo cutting boards make a great gift. Simply upload your loved one’s favorite photos and design a cutting board just for them with their style and personality in mind. Maybe you’re looking for a gift for your friend’s wedding. Why not design a tempered glass cutting board tailored to the happy couple’s taste. You can create a collage with their best couples photos, engagement pictures and more and select from various colorful background templates. It’s sure to be a wedding gift that’s well received since it’s both practical and fun! If your sister’s birthday is coming up, a photo cutting board would make a great birthday gift for her. Create a cutting board with prized photo of you and your sister and some loving text to make it all the more special. For her birthday, why not stop at our custom cutting board. 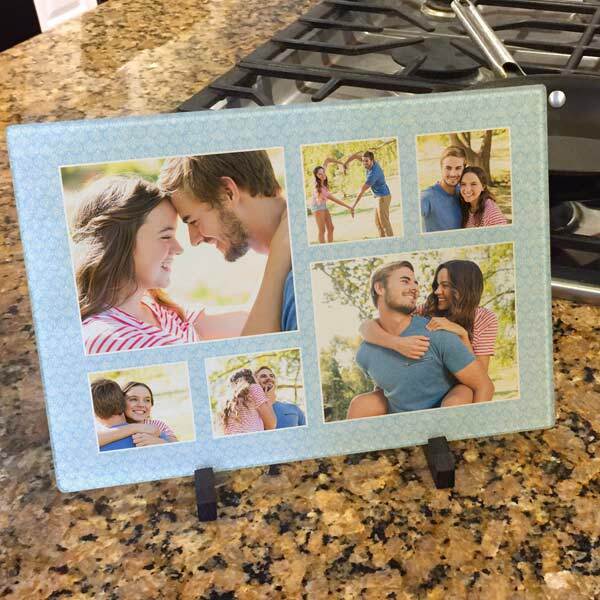 Create an amazing gift set including a photo serving tray and set of custom coaster to outfit her kitchen with her best photographic memories. Our personalized cutting board is not only a great way to show off your photos but is a big help around the kitchen with its convenient features. Each cutting board has rubber grips on the bottom to prevent slipping while cutting your favorite vegetables for your main dish or salad. Even better, you can wash them in the dishwasher or use a light detergent to clean them by hand for your next use. Tempered glass makes a great surface that is both easy to clean and reliable for slicing meat and vegetables with ease. With our custom photo cutting board, you can add color and character to your kitchen while enjoying a practical accessory that makes cooking fun. MyPix2 offers multiple cutting board templates to compliment your photos and distinctive kitchen décor. Easily create one for yourself or a loved one for a unique gift. Whether you want to showcase a beloved vacation photo or display a collage of fond family memories, our custom options will allow you to create the ultimate cutting board that brings your pictures to life. Whether you’re chopping vegetables for a salad or simply cutting up fruit for breakfast, our photo glass cutting board is sure to brighten your day!